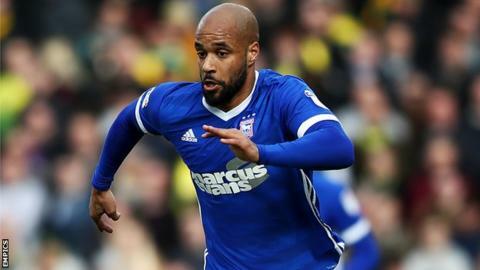 Ipswich Town striker David McGoldrick is set to miss the rest of the Championship season after tearing a tendon in his groin. McGoldrick, 30, missed most of December with a gash on his groin following a challenge against Sheffield Wednesday. The Republic of Ireland international may need surgery and is likely to be out for 10-12 weeks. "His injuries have always seemed to be serious ones from innocuous things," manager Mick McCarthy said. He told BBC Radio Suffolk: "It's really sad for him but we'll get him back right. I've just been asked about his contract, that's running out - who knows what's going to happen." Former Southampton and Nottingham Forest man McGoldrick has scored eight goals in 24 appearances this campaign and was sidelined for Ipswich's defeat by Cardiff on Wednesday. His contract at Portman Road expires in the summer.